We, the Scotts, are Adam and Tracy, Ezra (9), Eden (7), and Pearl (0). Pearl loves to gurgle and coo, stick things into her eyes and nostrils in an effort to find her mouth, and is generally working on determining whether or not the world and its creatures are trustworthy. We think she thinks it is, for now. Eden is imaginative, analytic, and spirited. She enjoys drawing and creating art that tells stories about people in relationship with the world, and she is interested in figuring out how letters and words, numbers and symbols fit together and make meaning. She likes to spell words frontwards and backwards. She likes to rollerskate, run, build legos, read books, climb ropes, swing, comb and braid hair, play improv games like her mama, and sing made-up songs. She is confident in her convictions. Ezra is fun-loving, creative, and wild. He plays the piano, loves Ray Charles and improvisation, likes to beatbox and breakdance, skate at the skatepark, play basketball and soccer, read Roald Dahl books, whittle sticks, make fire, fish, run 5ks, and launch custom paper airplanes from high places (especially the balcony in the church sanctuary). 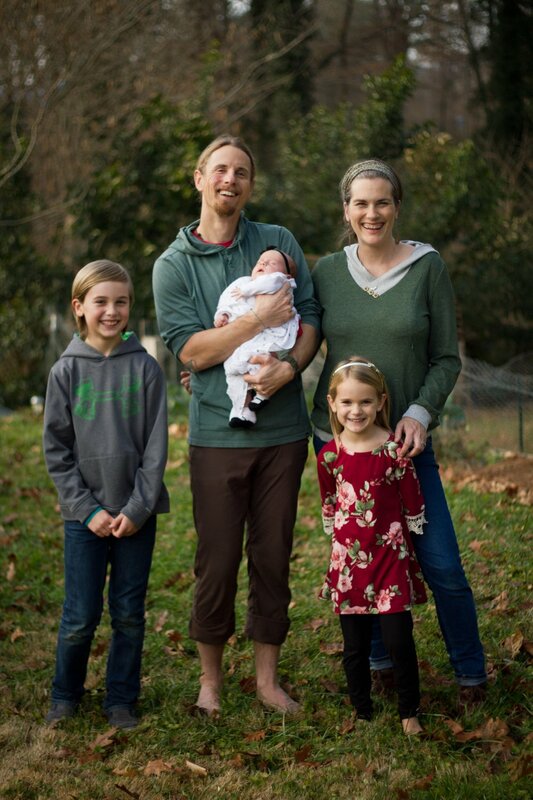 Tracy currently stays at home with Pearl, where she invests much time cultivating and growing beautiful things like the hearts, souls, and minds of her family and her friends, and edible things like kale, cabbage, and parsnips in her year-round garden. She likes to sing show tunes loudly, rise at dawn to pray and lift weights with her friends, make kimchi and other fermented delights, conduct culinary experiments with Melinda Palmer, and make people laugh (and cringe, uncomfortably) with Beth Forsythe and her other co-comedians in Morganton Improv every week. She also plans to continue pursuing licensure as a Licensed Professional Counselor in the near future. Adam is the Recreation Director at Southmountain Children’s Home, where he introduces foster kids to the ways and the wonders of God through all manner of challenge and play. He desires to see these kids heal and be made whole, and believes recreation is a means of re-creation, when informed by grace and truth. He also likes to read and write, play the drums, canoe, fish, climb, mountain bike, adventure with the men of Bridge42 at odd hours of the day and night, and make art reminiscent of redemption. Together, we, the Scott skulk, resonate with the family motto of Theodore Roosevelt: “Qui Plantavit Curabit” - “He who plants, preserves.” We perceive our work of living and growing in community in spiritual/agrarian terms, as taking the fertile seeds of Gospel life and carefully planting them in practices of intentional neighboring, family life, friendship, and vocation, that the produce of God might take root in the soil of our particular situation. We want “Thy kingdom come, Thy will be done on earth as it is in heaven” to be evident in the ecology of our family life. We read together, in our living room with bowls of ice cream, and on our rooftop with a picnic blanket. We like C.S. Lewis, J.R.R. Tolkien, Roald Dahl, E.B. White, and J.K. Rowling, among others. We run and roller skate together on the Morganton Greenway. We’re section-hiking the Mountain-to-Sea Trail. We like to host block parties a few times a year, to get to know our neighbors and share the love of Jesus through conversation and play. We love to spend time with our life group, the modest collective, and find that all of our play and work is energized by the Spirit in time spent together. We find our purpose as a couple and as a family in seeking to know our Maker and Savior through all the deliverances of reason, conscience, imagination, and revelation that He has provided, and then to translate this knowledge into a way of life that honors Him and makes His truth, goodness, and beauty known to one another and to those around us. We are inspired by the incarnation of God in Jesus, and want to imitate that act of presence, vulnerability, and love in our family life, our friendships, our neighborhood, and in our vocations and avocations, that God might be visible and glorified in us.